The big day is finally here. Our racing pigeons have arrived! Getting to this point has been a long journey, one that started in the summer of 2014. Dave and I were driving on the highway when we spotted a truck with the words CONTAINS LIVE RACING PIGEONS stenciled on the side. “What are racing pigeons?” I asked. He didn’t know, so I pulled out my phone and started googling. I learned that racing pigeons are specially trained homing pigeons that are released hundreds of miles away from their lofts and race home, relying on their homing instinct to guide them. Intrigued, I got sucked down the rabbit hole and was introduced to the two-hundred-year-old sport of pigeon racing. Once an international sensation and a popular family pastime, the sport is in danger of dying out because not enough young people are getting involved. I discovered extraordinary winged athletes that race at speeds of up to 60 mph for several hours at a time, earning them the nickname “thoroughbreds of the sky.” By the time I emerged from the rabbit hole, the idea for a children’s book about a team of racing pigeons had arrived, fully formed, in my brain. I spent the next few weeks resisting the idea. After all, I usually write novels for adult readers; I’d never written a children’s book before. Not to mention, I didn’t know the first thing about pigeon racing. There was just one problem: the idea wouldn’t leave me alone. I followed Dave’s suggestion and set out to learn about the sport of pigeon racing. 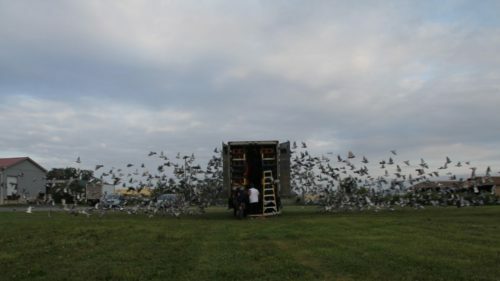 To my astonishment, I learned that Lehigh Valley, where I’ve lived my entire life, is an epicenter for pigeon racing. This discovery made it easy for me to track down a local pigeon fancier (a person who raises pigeons) and learn about the sport. Before I knew it, I was visiting a pigeon loft and attending races. The more I learned, the more story ideas kept popping into my brain. In order to turn these ideas into a proper children’s book, I immersed myself in the world of children’s literature and surrounded myself with experts who could teach me about the genre. I worked with two incredible writing coaches, who helped me see that my idea was bigger than the picture book I was envisioning and encouraged me to flesh out the characters and plot and turn it into a chapter book. I also connected with an amazing critique group of local children’s book writers, who I meet with monthly and whose feedback has helped me grow my story from two pages to sixty. I even had the opportunity to study character development at the Highlights Foundation. 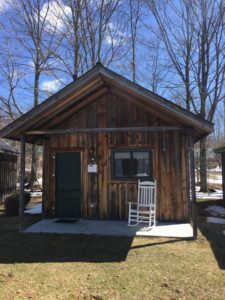 My private writer’s cabin at the Highlights Foundation. 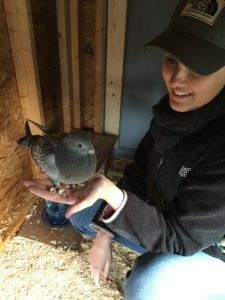 As my story came to life, I longed for my own racing pigeons that I could observe for inspiration, and, once the book was published, bring them with me to school visits to teach kids about pigeon racing. When I brought up the idea to Dave, he immediately saw my vision and encouraged me to go for it. 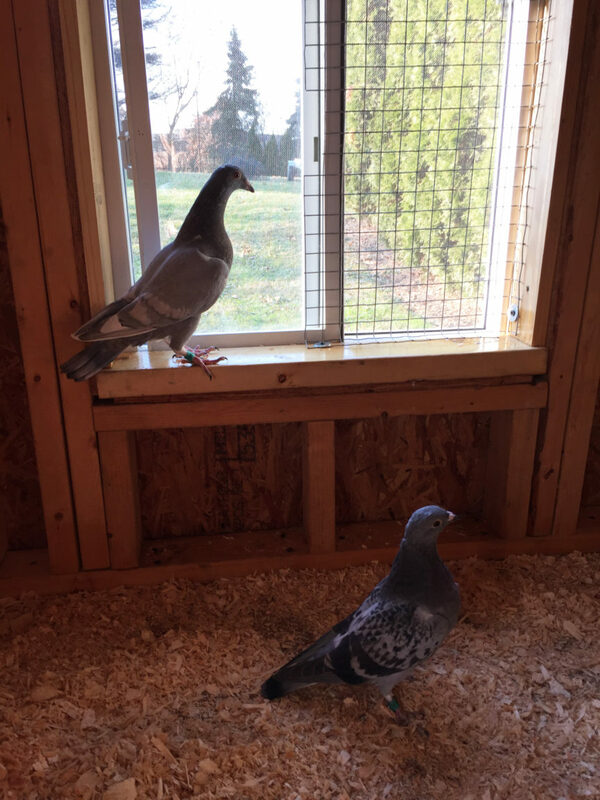 I contacted my friend Jim, who raises and races pigeons, to find out how I could acquire a couple of racing pigeons, and he generously offered for me to adopt two from his flock. Our baby racing pigeons hatched on October 12th and 13th, and they’ve spent the past several weeks growing feathers and learning how to fly. While they were doing that, we were busy renovating a coop for them to live in. Today, everything came together and the birds moved into their new home. Though they were a little wary of me at first, they warmed up quickly; by the end of our visit one of the birds was standing in my hand! Now, they just need names. You can help us name them by participating in our “Name Those Birds!” contest (ends January 31, 2018 at 11:59 PM EST). 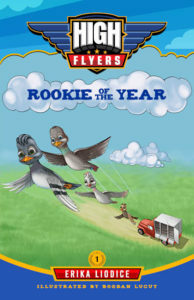 Two winning names will be selected, and the winner(s) will receive an autographed paperback copy of my new children’s chapter book High Flyers: Rookie of the Year (ages 7-10) and a surprise gift. Good luck! I love this…it is so cool. Can’t wait to read the book.